“Since I started gardening and eating my homegrown fresh produce daily, I’ve lost 30 lbs. and my health has improved dramatically. I was eating peppers because I liked their taste, only to find out later that they contain high concentrations of Vitamin C (about twice that of citrus fruits), Vitamin A, beta carotene, bioflavinoids, and antioxidants (which neutralize free radicals in the body fluids reducing the risk of disease). They also have antibacterial qualities. “Peppers have found a home in many Asian countries. Thai people consume an average of five grams of hot peppers per person, per day, twice the Indian average. Koreans eat ‘kimchi,’ a common pickled food strongly spiced with dried red pepper. South and Central Americans use peppers liberally in their cuisine. “Peppers have only recently made inroads into the U.S., and I believe soon they’ll be a staple in North America. In that I plan to help out! 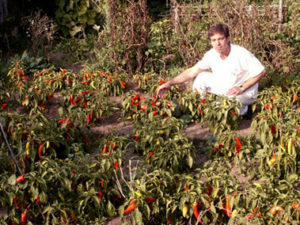 I customarily grow 6 varieties of sweet peppers, 3 varieties of large hot peppers, and 7 varieties of hot small peppers. I also cultivate squash, 8 varieties of tomatoes, tomatillos, lemon grass, lemon cucumbers, endive, and radicchio. I love to experiment with heirloom plants, so my list of specialty produce is growing. “I cater party & appetizer platters, and private dinners & gatherings in Monterey and Santa Cruz Counties. My preserved (jarred) produce can be shipped upon request. “I’ll be happy to answer your questions and supply you with all the peppers and produce you need for your next cooking adventure.